Stephen Harper’s Economic Record: Best in Show? According to the polls, Stephen Harper gets the highest score on handling the economy, though he only gets the nod from 38 per cent of Canadians. As the incumbent, he’s got the advantage on all other candidates. What the others have done and might do is a topic for another blogpost. This short summary of the Harper record on the economy may have even some Conservatives thinking twice before they elect the next Manager in Chief. After the 1981-82 recession, the lion’s share of annual government deficit was borne by the federal government (well over 85% for most of that decade). After the 1990-91 recession, the feds carried roughly two-thirds of the load. Today, the federal government is on the hook for the smallest share of post-recession government deficit on record. In 2009, 47% of all government deficit was federal; in 2010, it was 46%. As more borrowing gets done by lower levels of government, the carrying costs rise and Canadians pay more in tax than would otherwise be the case. Cost-shifting makes it cheaper for the feds, but more expensive for you and me. The Parliamentary Budget Officer warned that the Harper government didn’t have enough money to cover expenses even before the recession hit Canada. Having inherited a $13.2 billion surplus from the Liberals, Harper cut the GST by two percentage points – wiping out $13 billion in potential revenues for this year, according to Finance. His corporate income tax cuts have reduced the public purse by $10.4 billion for 2011-12; and personal income tax cuts another $13.6 billion. Without these cuts we may have avoided a deficit altogether. There’s more cuts to come, and Harper’s promises come with a hefty price tag. Splitting incomes ($2.5 billion); doubling contributions limits to Tax Free Savings Accounts ($6.6 billion); and more corporate tax cuts ($6 billion) will deepen Canada’s fiscal hole. Continuing to cut revenues before the books are in balance is not prudent management. And that’s before you add in Harper’s new expenditure plans. Where will the money come from to pay for the prisons, the fighter jets, the subsidies that propel the oil patch, the support for healthcare? The Harper team has rightfully highlighted the stability of our financial system in comparison to many other nations. But most of it had nothing to do with this government. Canada’s monetary policy, which swiftly responded as the crisis unfolded, is independent of the government. Government does regulate the banking sector, though. Ours is more regulated than many other nations and Canadians like it that way. We have fewer mega-players, despite years of lobbying by banks seeking mergers. We also have fewer over-extended mortgages. But we do have our share, thanks to Stephen Harper. In 2006 the floodgates were opened on zero-down, 40-year mortgages — the very thing that brought the global economic house of cards down in 2008. What had been a quiet practice since the 1990s became a bonanza for investors after Harper said yes to mortgage insurers in 2006: first Genworth, then AIG (remember AIG? ), then CMHC. When the credit crunch came, the federal government bought $69 billion of mortgages from the banks to keep the money moving. The banks didn’t sell the lowest-risk portfolios to us. Taxpayers are making money from the deal but that could change as interest rates rise or if another slowdown occurs. Canadians didn’t avoid the mess; we just came late to the party, courtesy of Stephen Harper. Harper often repeats that we have “regained” all the jobs lost in the recession — but they are not the same jobs. Almost half a million full-time jobs were lost in the first nine months, many with good wages, benefits and pensions. The oft-cited rapid bounceback of the labour market is at least in part a function of the fact that this was the first recession since the Depression where the majority of the jobless had no income support. No income, no savings? You’ll grab any job that’s out there. Most of the job creation since the market meltdown has been in healthcare, education and construction (largely public sector jobs — the part of the economy most likely to trim payroll in the coming months). Private sector job creation has been strongest in temporary positions, part-time jobs and self-employment. The biggest loss to Canadians post-recession? Income security. Emerging Challenges – Where’s the plan, Stan? Three big issues will dog the next few Canadian governments: climate change, aging populations, and growing inequality. On the first two, Harper has little to say. On the latter, the Conservatives are the only federal party whose proposals widen inequalities, rather than address them in a meaningful way. Harper touts himself as the best manager of Canada’s still fragile recovery, but offers no real plan to address today’s pressing problems or prepare for tomorrow’s. Nothing but tax cuts and less interference in the market, that is. Every election campaign is like a job interview. Voters listen and watch candidates as they show what they’ll bring to the job, with style and substance. Whether Harper, Ignatieff or Layton, remember to go back to the résumé before you make the hire. • How Much Will Stephen Harper Cost You? and that it’s just by “the grace of god” that Canada isn’t in even worse shape! Imagine what might happen over the next 5 years if GOD FORBID Harper were to get his lusted-after majority (with over 70% of electors not having voted for him)? You could go either way with any of the points you’ve made. I really don’t see the definitive evidence that Harper has done a poor job in this article. 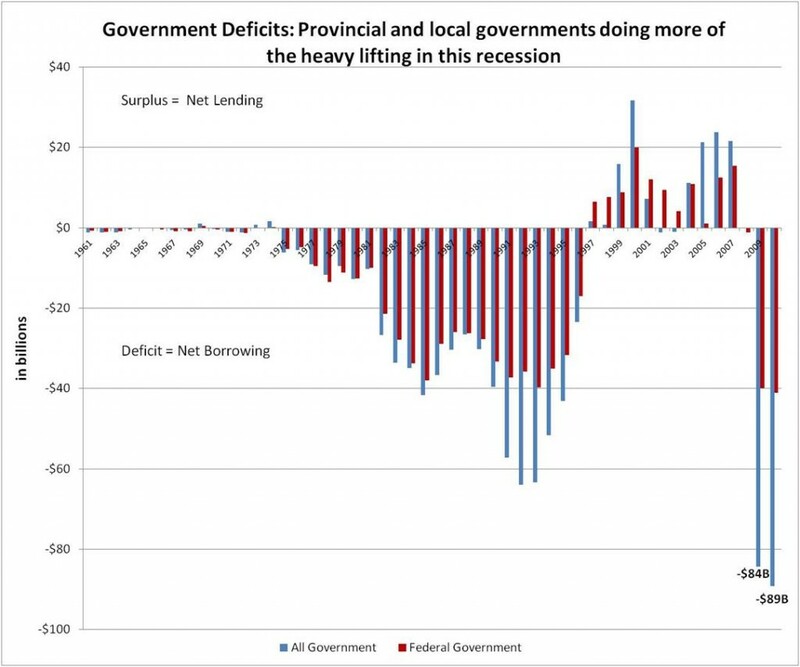 Between 1990 and 2009, for example, one might point out that fiscal imbalances between federal and provincial governments were created by the Chretien government. The issue has in fact been one of M. Duceppe’s perennial complaints since he has been leader of his party. It is disingenuous of the CCPA to suggest that Harper is the cause of the imbalance. As for the deficit, putting corporate income tax cuts and personal income tax cuts in the same tier as rolling back a consumer tax like GST is again disingenuous. When Mulroney introduced the GST, people were angry about a new tax simply because it seemed like an extra burden. Now the idea of a consumer tax is mostly regarded with suspicion because it taxes richer and poorer Canadians at the same rate, so the poor have to pay proportionately more of their income for necessities. Besides, it is difficult to measure lost revenue from tax cuts since it is impossible to know how many individuals and corporations would have set up business in Canada or expanded had they not had the added incentive. Canadians may not have avoided the mess of the global financial crisis, but you can hardly fault Harper for a global meltdown. Of course the government would have bought the higher risk mortgages because the banks would have no incentive to get rid of their low risk mortgages. The high risk mortgages are the ones that banks would be unable to guarantee in a pinch. Plus, accusing Harper of mismanagement on the possibility of future financial crises is not convincing at all. As for a loss of income security, welcome to my generation and its prospects. We don’t know about a loss. We’ve never had it in the first place. As for your last point, you would probably have done better to write a separate article to better detail your qualms with Harper’s stance on those three issues. It appears to my eye that there is not enough room in this post for you to articulate fully what you mean. Your arguments are interesting to read, and certainly paint an unfavorable picture of the Harper government. However, you rely too much on the power of suggestion and not enough on exact evidence. I am sure there are weak points in Harper’s economic policies that you could more thoroughly skewer, but I do not think you have brought up those particular policies in this article. I’m sure your article is great for people who are already angry with the Harper government, but it does little to convince the rest of us. This article totally convinced me. ABH! Wasn’t the Liberal party supposed to wipe out the GST altogether the last time they were elected to a majority?? Greens and Liberals need to lend the NDP their vote this election to stop Harper. The Cons “would now be ticketed to receive the lion’s share of Ontario seats with less than two-fifths of its votes. Greens and Liberals, Harper must be stopped…. For the sake of the country! “The gap between the front-running Conservatives and the rising NDP has narrowed to just three points, a new poll finds. The EKOS-iPolitics survey shows the Liberals trailing 11 points behind in an increasingly tight two-way race to the finish. Latest three-day polling data finds the Conservatives with 34.6 per cent of support of decided and leaning voters, the NDP holding 31.4 per cent and the Liberals clinging to 20.4 per cent. And because the NDP holds a distinct advantage as the second choice for the greatest number of Canadians, pollster Frank Graves said the party still has room to grow if it wins over wavering voters in the final hours of the campaign. Google the Catch22 Campaign for details on the best strategic voting. Psst, pass it on…..make sure to vote today and tell all your friends. If just 10% more people had voted last election, Harper would never have been elected! This is by far the most important election of our lives! I voted NDP in my Burnaby Douglas riding because I think the conservatives have betrayed two of their core values: to be fiscally responsible and to be tough on crime. The latter because he was ruled on by the speaker of the house who rules on procedure, that he was in contempt of parliament. This was not contrived, the speaker of the house is not of any political party, where is his supposed bias? Now doesn’t this make Harper a white collar criminal? How can any true conservative really want to elect a criminal? He wants to stifle any voice that doesn’t agree with him. DON’T BE SHEEP! VOTE YOUR VALUES! HARPER HAS BETRAYED HIS!